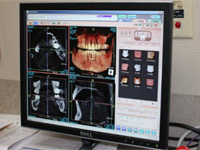 Dr. Reece and our clinical team invest in the technology and training to make your dental experience magnificent! We offer digital X-rays, a technology that exposes patients to about 90-percent less radiation than traditional radiograph machines. We also use SCAN-X Digital Imaging System to manipulate digital photos so that they reflect what your smile would look like after dental procedures. This will allow you to make truly informed decisions about care! While you're in the dental chair, ask for a warm therapeutic neck pillow and personal headphones to listen to your favorite music. As Dr. Reece's patient, prepare to be pampered! PreXion Cone Beam Cat Scan allows us to take 3-D images for accurate diagnoses and procedures.